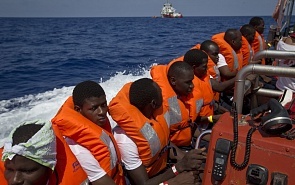 The negotiations at the France-Germany-Italy-Spain-Chad-Niger-Libya summit on migration last Monday are not likely to lead to success, Andreas Andrianopoulos, Director of the Institute of Diplomacy and Global Affairs at the American College of Greece told valdaiclub.com. “First of all, even the proposals are wishful thinking; there is little possibility of them being implemented. It takes months or even years to implement them. All that time, the flow of migrants would continue. I don’t think it is easy to implement them because it requires a lot of money, effort and coordination between bureaucracies and between states,” Andrianopoulos said. He noted that previous efforts to tackle the problem of migration have not worked, even inside the European Union, as Eastern European countries rejected the resettlement of migrants on their territory. “There have been efforts to transfer migrants to various European countries, this has not happened because most countries refused to accept refugees. Some countries, especially in Eastern Europe, do not like the fact that Muslims will be setting in their countries,” Andrianopoulos said. Andrianopoulos also added that the EU’s “carrot” approach is not likely to work, and that punitive measures should be applied to countries that are the source of migrants. “In Greece, for example, you may have an uninhabited island, on which you can make residential facilities, take them in, check if they are refugees or not and then deport them and force the countries of their origin to accept them back. Otherwise it would have financial repercussions for the countries with which they have bilateral agreements,” Andrianopoulos said. “The EU, although it has the ability, has not forced these countries to implement sanctions on those countries that refuse to accept deported asylum seekers. So it’s a problem, a very bureaucratic problem I do not see how any European nation’s administration would be able to implement this plan,” Andrianopoulos concluded.